It’s easy to find fresh, local produce through October at Vermont groceries, co-ops and farmers’ markets. But when the weather turns, some former localvores will shell out more than $10 per pound for California lettuce. Others will flock to the freezer aisle for bags of veggies from the Pacific Northwest. Do they have to? Not necessarily. It’s increasingly possible to find locally grown spinach, carrots — even tomatoes — sharing our veggie aisles with their California competitors. On November 22, from 10 a.m. to 2 p.m. at Burlington’s Memorial Auditorium, local farmers will hawk veggies at the city’s first-ever winter farmers’ market. At Montpelier High School, the Capital City Winter Farmers’ Market has grown from one to two Saturdays per month. Today’s season-extension technologies, Grubinger explains, were pioneered in the 1970s by a University of New Hampshire vegetable specialist named Otho Wells. “Man, it’s cold up here!” Wells remarked to himself, according to Grubinger, after relocating from South Carolina. The southern expat went on to design cold-weather plastic mulch, heat-trapping “high tunnels” and new kinds of floating row covers — “poly-something-or-others” that keep plants warm without shutting out sunlight or moisture. Greenhouses and high tunnels are key players on any winterized farm. Inside these movable structures — a high tunnel is the Mini-Me of a greenhouse — clear plastic panels trap radiant heat reflecting off the ground. The heat helps plants grow in a warmish environment despite chilly outside temps — think global warming on a small scale and without horrific consequences. The latest season-extension trend? Renewably powered greenhouses and high tunnels. Since 2006, Vermont’s Agency of Agriculture, Food and Markets has diverted a percentage of the state’s $1.3 million Clean Energy Development Fund toward alt-energy farm projects. Most early applications to the $300,000-per-year grant purse came from dairies, reports Dan Scruton, a senior agricultural development coordinator at the agency, but vegetable and ornamental-plant farmers are beginning to get wise. Last year, a Cabot farm got $10,000 for turning Christmas tree trimmings into wood pellets. The ex-ornamentals will power a greenhouse full of pumpkins. Not all indoor growers can afford to go green. Take Whipple Hollow Hydroponic Farm West in Rutland, which ships up to 200,000 pounds of tomatoes every year all over Vermont and to parts of New York. Founder and former owner Barre Roche reports spending an “absolutely exorbitant” $35,000 annually to heat his greenhouses with propane. Roche says he would have switched to wood chips if the investment cost had not been so daunting. At River Berry Farm in Fairfax, co-owner David Marchant spends more than $12,000 to run six propane-powered greenhouses in early spring; it would cost too much, he says, to start any earlier. Some farmers bypass heat altogether — by sticking to the durable root vegetables that have been Vermont winter staples for centuries. 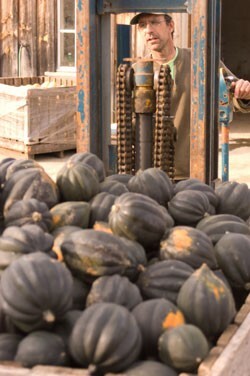 On a recent October afternoon in Fairfax, Marchant stands at a loading dock amid crates of pumpkins as a farmhand washes butternut squash in a gangly metal machine. Root veggies, not greens, are River Berry’s biggest sellers. Up to 200 of these crates, each holding 20 bushel bins’ worth of carrots, pumpkins, squash and other roots, will be stored here, Marchant explains, then shipped over time to Johnson-based Deep Root Organic Cooperative, City Market, Healthy Living and the Burlington winter farmers’ market. Plant body heat keeps the packing house warm. In fact, this root-veggie storage warehouse requires air conditioning to prevent rot. Buley recalls that he learned about season-extension techniques “before localvore was cool” — in the early 1990s, while attending cooking school in Paris. Wintertime greens don’t have to contend with as many insects and weeds. They also give Buley a leg up over his competitors, most of whom don’t sell produce in the winter. Producing vegetables without heat can be tough, Buley notes, and not because of cold fingers. Potentially destructive fungi like the humid growing environment inside winterized greenhouses, for one, and a short fall planting season makes early mistakes more pronounced than they would be in warmer weather. What’s more, even a well-insulated greenhouse won’t get much light in winter, causing every crop to grow super slowly. Screamin’ Ridge didn’t produce greens last January because heavy snow and clouds obscured the sun. Last Tuesday, Buley was one of several Vermont farmers who attended a “matchmaker” event at Randolph’s Three Stallion Inn. Deputy Secretary of Agriculture Anson Tebbetts tells Seven Days that some small-scale producers have trouble connecting with potential buyers. So the agency periodically hooks up vegetable farmers, cheesemakers, beekeepers and bakers with purchasing reps from Wal-Mart, Price Chopper, hospitals and food co-ops. And if he can help localvores eat their lettuce and have their sustainability, too, that’ll be a match made in heaven.